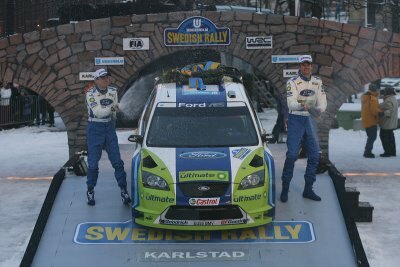 today when they won the Swedish Rally in a Ford Focus RS World Rally Car. The Finns led from start to finish on this second round of the FIA World Rally Championship to provide the perfect birthday present for Grönholm who is 38 today. The Swedish Rally is the only pure winter event in the series and temperatures which dipped as low as -23˚C in the snow-covered Värmland region ensured perfect conditions for the three-day event. BFGoodrich's studded winter tyres provided perfect grip throughout and Grönholm's dominance was reflected by the fact that he won 10 of the 19 speed tests, covering 349.02km. Grönholm began today's final leg, held on fresh overnight snow, with a 25.1sec lead over Sebastien Loeb. However, a hydraulic oil leak on the third special stage allowed Loeb to reduce the gap to just 14.4sec before Grönholm responded with fastest time on the final three tests to win by 30.9sec. "This is another fantastic result," he said. "After my first test in the Focus RS here before Christmas, I thought I could take a good result in the rally but to win is just amazing. To win both my first two rallies in the car is a dream and it's good for the future. My birthday isn't so important now. The big thing for me is that the Focus has proved so competitive all weekend. BFGoodrich provided me with great tyres and I set some superb stage times. I just hope that the car will be as competitive on gravel because it would be great to continue this winning run on the next round. "We had a scary moment this morning when hydraulic oil began to leak onto the windscreen midway through the last stage before service. I had to use the manual gearchange system and had no active differential. I carried on until the end of the stage but lost a lot of time." The leak was traced to a filter which exploded, spraying all the hydraulic oil onto the windscreen. The team replaced the filter and the Focus RS was restored to full health. Ford TeamRS director Jost Capito said: "To win the first two rallies of the season, both of which are very different in nature, with a car based on the new Ford Focus ST is fantastic. 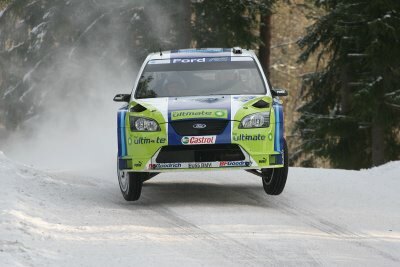 It's great that with the Focus RS WRC we can offer Marcus and Mikko a car in which they can show their talent."